Oceanfront Views from the Large Third Floor Balcony! Our three bedroom, three bath condos have everything you'll need for your vacation getaway. For all occasions, these vacation rentals will be sure to please. Large, Roomy and Ready for YOU in Panama City Beach! 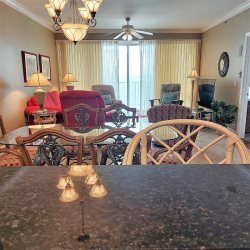 Amazing Beachfront Unit For Your Amazing Panama City Beach Stay! Beachfront Paradise On The Second Floor! Elegant and Comfortable Beachfront Charmer!